It has been a long time since esthetic skin treatments have been associated only with worshiping beauty and vanity. With treatments being performed at estheticians’ offices by skilled professionals, such treatments have become an ally to well-being and are beneficial to health in general. Body esthetics treatments can relieve everyday tension, boost the immune system and lift one’s self-esteem because once an individual is satisfied with his or her appearance, quality of life also improves. A professional esthetician is apt to provide body and facial esthetician services such as skin care, lymphatic drainage, waxing and sculpting massage, among others, to promote satisfactory beauty, health and well-being results for the patient. Esthetic treatments are increasingly in high demand and following that trend, equipment as well as products are being reinvented and improved in the market. High-tech equipment is used to obtain almost immediate results. In addition, because of the need for short-term results or the fear of possible risks and complications of invasive surgeries, the demand for non-invasive esthetic treatments has been gradually increasing. In the reduction of localized fat, one of the “beloved” methods of the moment is Cryolipolysis, defined as a non-invasive liposuction that promises to reduce 25 percent of localized fat in the first treatment. Cryolipolysis is a very innovative approach for non-invasive fat reduction by freezing away and eliminating fat without damaging the skin or other tissues. “We are in the winter and the demand for treatments that eliminate localized fat is higher during that season. Women want to have that beautiful body ready to enjoy summer,” emphasizes esthetician Sthefany Effquen. Are you bothered with stretch marks? Treatments with cutting-edge methods promise to end this problem that affects many women. Combining hydro peeling with micro-needling skin therapy can stimulate the production of collagen in the affected area. A satisfactory result can be attained with a few treatment sessions with a 50 to 80 percent reduction of the troublesome stretch marks. 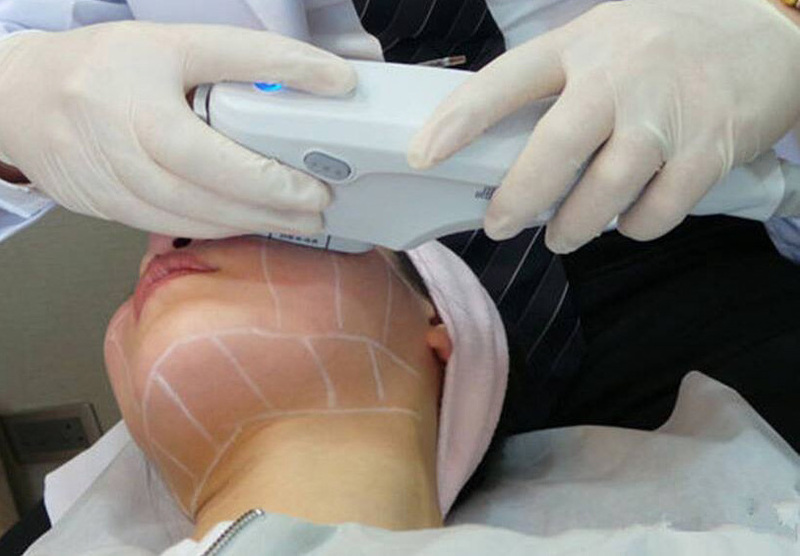 High Intensity Focused Ultrasound (HIFU) therapy is indicated to reduce skin laxity, especially in the face and neck areas, but it can also be applied to other parts of the body. The procedure is recommended for patients with facial laxity that are not willing to undergo plastic surgery. “It stimulates the cells for new collagen production. The results of the HIFU are immediately visible after a single session,” explains Effquen. The advantage of esthetic treatments is that because they are non-invasive, there is no need for recovery time and the person can go back to his or her social and professional activities right after the treatment. For esthetician Sthefany Effquen, winter is the perfect season for starting any type of skin or body esthetic treatment. “A great number of treatments require a patient to avoid sun exposure. For that reason, winter is perfect for face and body treatments. During the winter, the number of appointments at my spa increases. My clients start thinking about summer and investing in their well-being,” she explains. Sthefany Effquen’s Spa is located at 6 Down Street in Danbury, CT. To set up an appointment, please call 203-501-5806. Why Are They Still Calling?